Well it doesn’t get much easier than this on a Monday morning! Thought I’d play along with the CAS challenge over at Splitcoast. It’s a sketch challenge today and you can find it here. This card is easily done in under 10 minutes if you’re looking for something really quick. Take a standard card base and round two corners. Cut a piece of the Lifestyle Crafts Shape ‘n Tape and place across the card. Then die cut the little word bubble and stamp the sentiment on it. Add a few rhinestones and done! Easy peasy…right? What a great CAS card! Cute! How adorable! 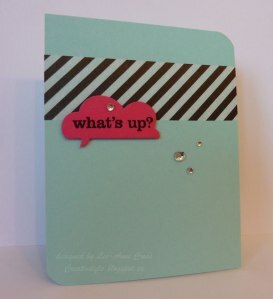 Who would have thought this beautiful card could be so easy and made so quickly. I love it, Lee-Anne. Fabulous cas card! I struggle to do cas, awesome work Lee-Anne!